Would it surprise you to learn that statistics indicate the spa industry is worth more than $16 billion yearly, and it is expected to increase year after year? No wonder so many people have already opened spas, or are in the process of doing so. Among the many pieces of equipment and supplies you’ll need as a spa owner is a bath towel you can count on but that doesn’t break your budget. That’s why Towel Super Center offers premium white bath towels at wholesale prices. Every premium white towel is 24” by 48”, generous enough to fit most patrons easily. Plus, the towels are sold in units of one dozen. Need plenty of units? Your per-towel price will keep going down. Order wholesale bath towels for your spa today and discover why every spa should have cotton! Why pick cotton over other kinds of fabrics for your spa’s bath towels? The answer is simple: Cotton offers the best value and highest attributes of other materials. Durability. Cotton is notoriously durable, especially these premium white bath towels. Constructed precisely, their weave allows them to have the flexibility you want and the strength you need. Forget about having to buy replacement towels all the time. These are the towels that will work hard use after use. Softness. You’ve experienced the fluffiness and cuddliness of cotton, and that’s what you’ll get from this bath towel. Pamper your guests every time they come to your spa, and pamper your employees who have to fold and distribute the towels, too! All-Natural Stain and Odor Resistance. Who wants to wrap themselves in a towel that has a strong, unpleasant odor? Your patrons deserve towels that smell fresh, and that’s what you’ll get with cotton. Cotton’s fibers naturally resist holding on to stains and aromas, especially when they are regularly laundered, and deep stains are pre-treated. Quick-Drying. Have you ever felt like your current bath towels take too long to dry? Reduce your energy consumption with quicker-drying cotton bath towels instead. Cotton may even help you lessen the utility cost load on your budget. Quick-Absorbing. Just as fast as they dry, cotton bath towels also wick up moisture. Your guests won’t have to use tons of towels to get dry, and that will make them happy — and save you money. 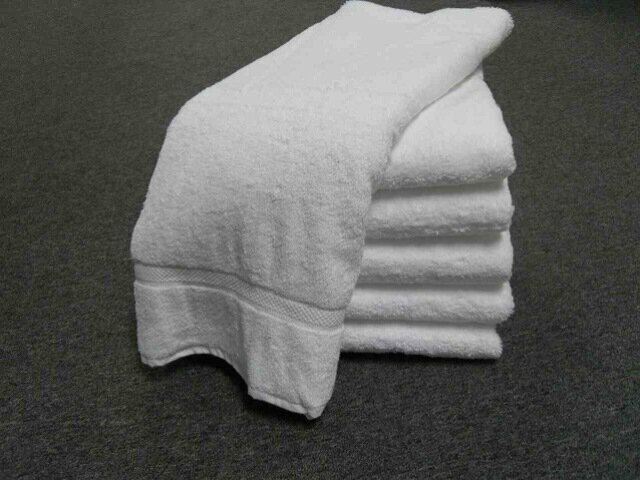 After you purchase your premium white wholesale bath towels from Towel Super Center, as well as your other spa towel needs, make sure you take the steps to keep them in pristine condition. First, practice good laundering techniques. For instance, pre-treat any dark stains or odors with your favorite product. This will help the cotton’s natural affinity for cleanliness work better. When laundering, use a detergent with a bleach alternative rather than bleach itself. Bleach may keep the cotton bath towels white, but it can leave unpleasant smells. Additionally, some people are allergic to the residue of bleach. When drying your cotton towels, add dryer balls. They help provide that fluff factor and can reduce drying time — without negatively affecting sensitive personnel or patrons. Order your towels from Towel Super Center today!